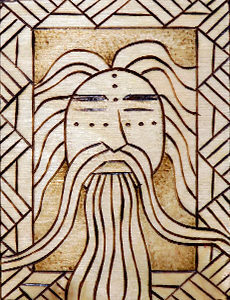 Mímir is one of the stranger figures of the Æsir pantheon. In his current form, the form we encounter him in as readers, the god is just a disembodied head. Despite this (or perhaps because of it) Mímir is a god associated with wisdom and the pursuit of knowledge. He is mentioned many times across many stories and through many kennings, but his personal story is short and it seems that his role within the pantheon is more important than his former deeds. Mímir’s main attestations are the Prose and Poetic Eddas, Heimskringla, and the poems Sigrdrífumál and Fjölsvinnsmál. He is referenced mostly in association with other gods within their own myths. Before he lost his body, Mímir was a respected and wise Æsir. He may be the brother of Bestla, making him Óðin’s uncle. This makes sense, as he was considered important enough to be traded to the Vanir as a hostage to secure peace in the war between the two tribes. Mímir and Hœnir (Óðin’s brother in some stories) were traded for Njörðr, Freyr and Freya. The Vanir thought Hœnir was a fantastic trade – he was described as tall, handsome, and a capable warrior – and made him a chieftain. It soon became apparent, however, that he couldn’t make a decision without Mímir’s council. In retribution for this weakness, they cut off Mímir’s head and sent it back to the Æsir. Fair enough. Not to miss a golden opportunity, Óðin embalmed the head with a secret recipe of herbs and spices, and spent years carrying it around, gleaning all of the wisdom he could from it. Afterwards, he set the head to guard the well of wisdom which bears Mímir’s name – Mímisbrunnr. The guardian of the well drinks from its waters, expanding his already substantial wisdom. Óðin visits Mímir again and famously exchanges his eye for a drink from Mímisbrunnr, and it may be that the god Heimdallr traded one of his ears for a drink as well. Disembodied heads as gods is a common theme throughout Norse, Celtic and Saxon myths – amongst others, though the similarities between these cultural cousins are striking. For instance, Bran the Blessed may be a version of Mímir (or vice versa) and his disembodied head is set to guard the island of Britain, offering wisdom to future chieftains and kings. Other headless/disembodied head deities around the world include Chinnamasta, Ganesha, John the Baptist, Baphomet, Medusa, and Ketu. In fact, all throughout history, across many cultures, heads were revered as the seat of the soul, of wisdom, of vitality and power, and were variously chopped off, used as decorations, shrunk, preserved, displayed, eaten … the list goes on. Heads are culturally important, aside from being medically necessary for life, as symbols, both spiritual and political. It seems that re-using jötunn bodyparts was something of a tradition amongst the gods. Óðin and his brothers created Miðgarðr out of the body of the first giant, Ýmir, and his head became the dome of the sky … while his brains became the clouds. Heads. Wells and fountains. Emblems of wisdom, learning, and knowledge – especially occult or secret knowledge! Advice, counseling, and teaching. Pickles if you’re desperate.